ABC is reporting on the only known recorded letter by an Australian WWI soldier. Listening to the three and a half minute recording is an uncanny experience. He doesn’t know what to do with his precious time. He wishes he could move beyond the conventional greetings, and tell them plainly what he feels – but he can’t. A hundred years ago, they believed in technology more than we do. It was far more magical. He remarks that this is an unusual way for him to arrive in Australia. He says at the end, in the most poignant moment, that he “can’t leave this instrument”, but wishes he could jump out and join his brother (?) on a trip to the theatre. Today, we don’t believe in the illusion with such whole-heartedness. We are so used to transmission and recording that we do not think of it as a part of ourselves. 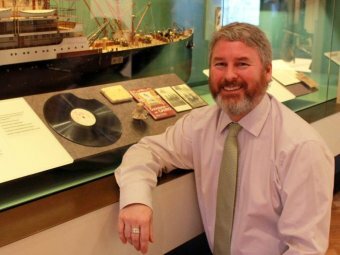 The original disc is missing a chunk – imagine if you were the family member who dropped it, and silenced Uncle Henry for decades until the Australian War Memorial restored him to life.